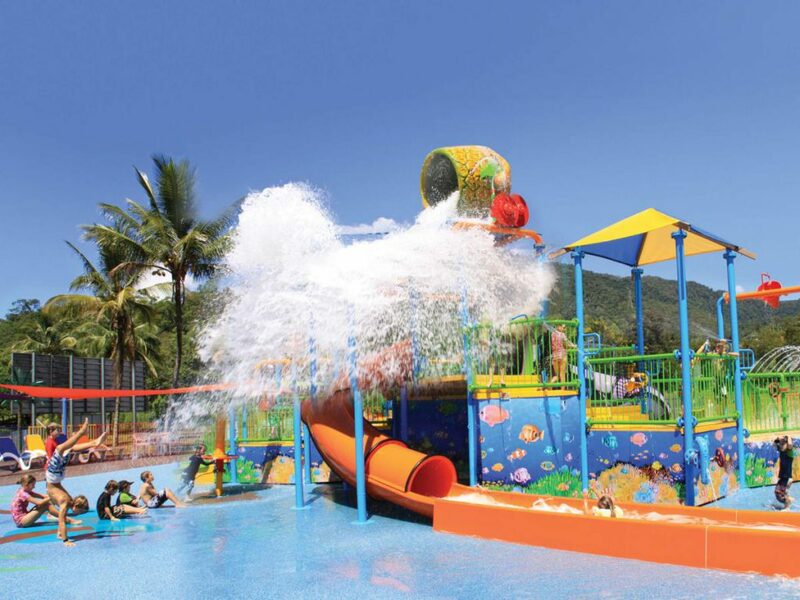 Ingenia Holidays Cairns Coconut is famous for summer fun. The ‘SPLASH’ water playground is a wonderful attraction for kids, keeping them busy and occupied in the hot weather. Mum and Dad, sit back and relax on a shaded lounge while keeping a close eye on your water babes! The multi-tiered playground has numerous interactive water features, a big orange water slide and everyone’s favourite – a tipping bucket! Lather the kids with sunscreen, chuck on a rash vest and let them run wild in this water wonderland. Big4 Adventure Whitsunday Resort is truly a summer paradise. 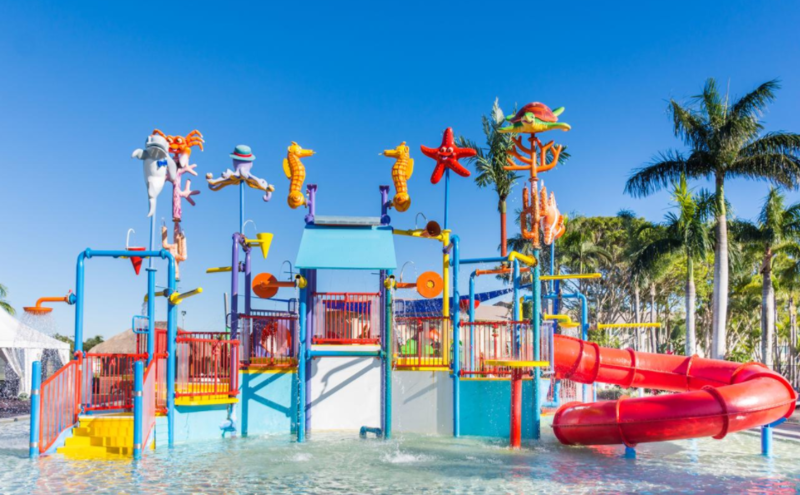 The resort’s massive, brand new water playground boasts 13 colourful slippery slides spouting from a two-metre high platform. The slides are all linked by bridges and staircases – perfect for the kids to play and interact! At playground’s far end, a huge tipping bucket fills and spills on those underneath. For families travelling with bubs, small frog and octopus-shaped water features will keep them entertained and cool. You’ll find the resort’s fun mascot, Gavin the frog, throughout the playground. Craving a summer getaway in NSW? Look no further than Tathra Beachside South Coast. This holiday park has everything you need for a family friendly vacay – especially in summe. The multi-tiered water playground has multiple slides and interactive activities for the kids. The twin slide is perfect for tiny tots with competitive natures. Situated in the middle of a shallow pool, the playground is safe for (supervised) littlies. Renowned for its family-friendly atmosphere, Oaks Oasis Resort is loved by kids of all ages. 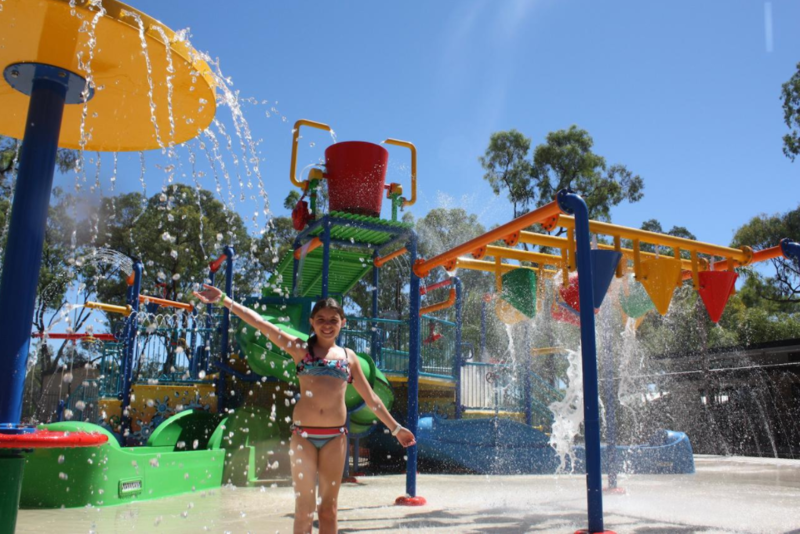 One of the caravan park’s star attractions is the multi-level water playground, located among 10 acres of lush garden. Here, the kids can slip and slide on the playground, play under the water fountains and stimulate their brains with interactive games. The cute little sea creatures positioned above the park give it so much personality. You’ll love cooling off this summer at Oaks Oasis Resort. 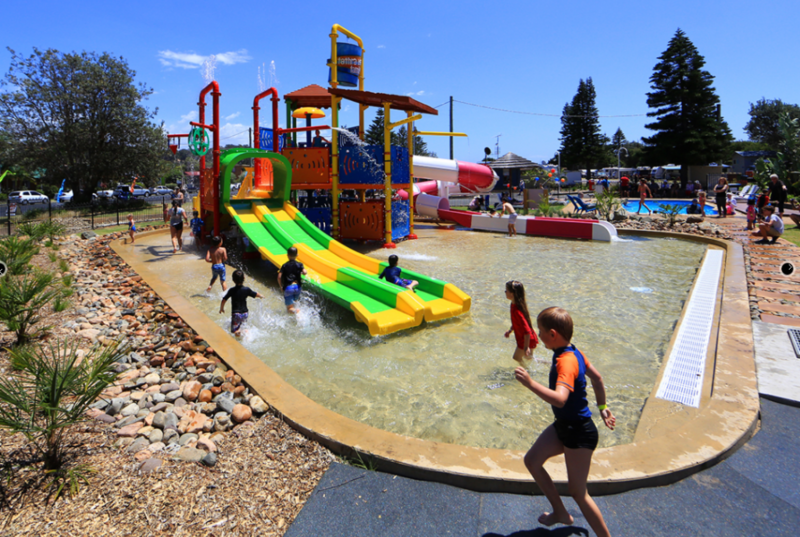 BIG4 Inverloch Holiday Park is home to a new surf-themed splash park! This water playground is the complete package. It features a shark tipping bucket, cannon guns, water fountains and water slides. Most importantly, it’s protected from the sun! Jam-packed with a plenty of interactive games, the park is super popular with kids of all ages. 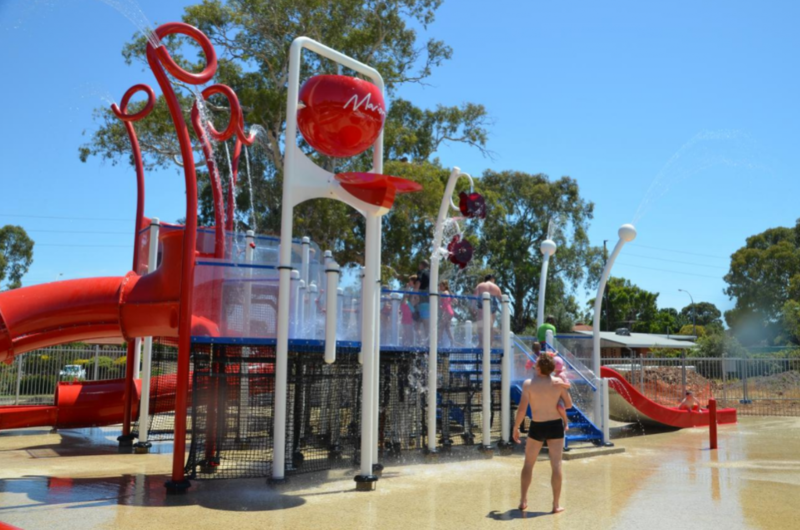 The water temperature is controlled year round so it can be used in all seasons; this playground is an Aussie first. Turn your summer dreams into reality at Marion Holiday Park. Here, you will find one of South Australia’s best water playgrounds. Highly recommended by past and present guests, this facility offers plenty of fun for children of all ages. The playground comprises water slides stemming from the many platform levels, sprinkling water features, a tipping bucket and spray fountains. Although the park itself isn’t protected from the sun, some features are shaded, particularly those beneath the platforms. If you’re in need of a kid-friendly summer getaway, BIG4 Sunshine Resort is perfect. 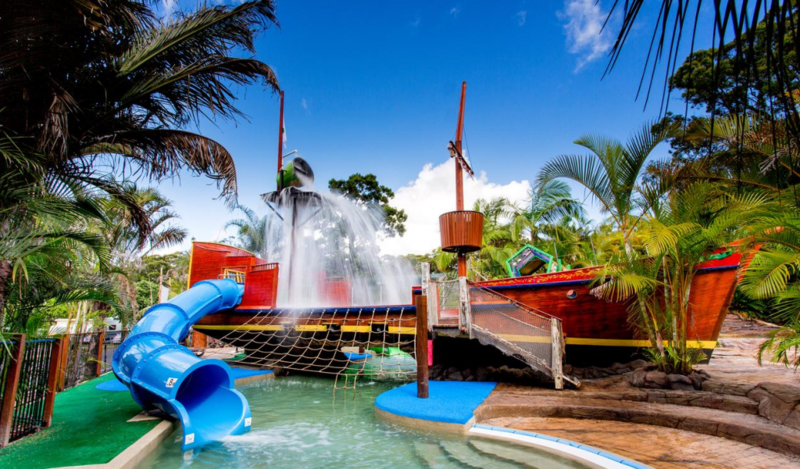 Shipwreck Island is an interactive water playground with oodles of character! Not only is there a huge pirate ship, the park has a giant tipping bucket, water slides, water cannons, a rope climb and more. The kids will feel like they’re in another world and can run amok while you relax. If you’re travelling with little water babes, don’t worry – the park caters for them too. There’s an Octopus slide into a shallow pool, and small animals for them to play on (sculptures of course). Aside from this, BIG4 Sunshine Resort itself has quality features and accommodation. You won’t be disappointed! Are you ready for a splashdown? BIG4 Renmark Riverfront Holiday Park has just the place. Their water playground provides endless fun for kids of all ages! This multi-level water park boasts slides, sprinklers, water tubes, spray guns and (of course) a tipping bucket. The whole family can cool off together; this playground is next to the park’s swimming pool and spa. ⟵Lightweight Hiking Gear – must haves!